A RARE golden babirusa specimen stood encased in glass in a dusty little corner of the National University of Singapore (NUS) for decades. 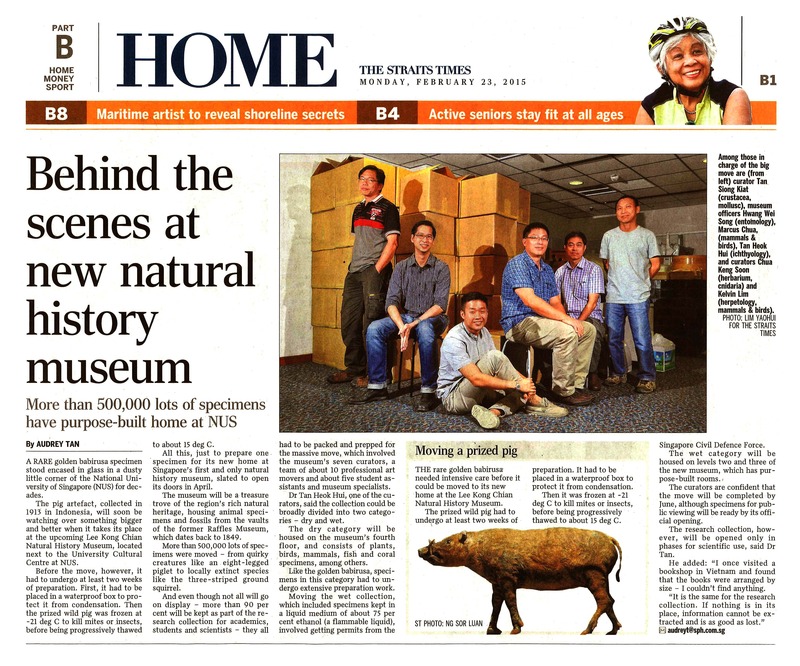 The pig artefact, collected in 1913 in Indonesia, will soon be watching over something bigger and better when it takes its place at the upcoming Lee Kong Chian Natural History Museum, located next to the University Cultural Centre at NUS. Before the move, however, it had to undergo at least two weeks of preparation. First, it had to be placed in a waterproof box to protect it from condensation. Then the prized wild pig was frozen at -21 deg C to kill mites or insects, before being progressively thawed to about 15 deg C.
All this, just to prepare one specimen for its new home at Singapore’s first and only natural history museum, slated to open its doors in April. The museum will be a treasure trove of the region’s rich natural heritage, housing animal specimens and fossils from the vaults of the former Raffles Museum, which dates back to 1849. More than 500,000 lots of specimens were moved – from quirky creatures like an eight-legged piglet to locally extinct species like the three-striped ground squirrel. And even though not all will go on display – more than 90 per cent will be kept as part of the research collection for academics, students and scientists – they all had to be packed and prepped for the massive move, which involved the museum’s seven curators, a team of about 10 professional art movers and about five student assistants and museum specialists. Dr Tan Heok Hui, one of the curators, said the collection could be broadly divided into two categories – dry and wet. The dry category will be housed on the museum’s fourth floor, and consists of plants, birds, mammals, fish and coral specimens, among others. Like the golden babirusa, specimens in this category had to undergo extensive preparation work. Moving the wet collection, which included specimens kept in a liquid medium of about 75 per cent ethanol (a flammable liquid), involved getting permits from the Singapore Civil Defence Force. The wet category will be housed on levels two and three of the new museum, which has purpose-built rooms. The curators are confident that the move will be completed by June, although specimens for public viewing will be ready by its official opening. The research collection, however, will be opened only in phases for scientific use, said Dr Tan. He added: “I once visited a bookshop in Vietnam and found that the books were arranged by size – I couldn’t find anything. ← Love Gone Wild at Pulau Ubin!